Beetle-mania. Beetles are the largest group in the Animal Kingdom, representing about a fourth of all animals. Currently, more than 350,000 beetle species have been identified. Yet scientists who study beetles (coleopterists) are certain there are thousands more that have not been discovered yet! You may be familiar with some of the many different beetle species by their common names: ladybugs, June bugs, weevils, lightning bugs or fireflies, borers, and potato bugs. No other animal group has such a range of color, shape, and size. Some beetle species are as large as your fist; others are so small they can fit through the eye of a needle. Many species are brilliantly colored, like jewels, while others cleverly blend into their environment. No matter what shape, size, or color, it is safe to say that beetles are the most successful group of animals ever known! Beetle body parts. The body of the beetle consists of three main segments: head, thorax, and abdomen. Head— The head is where the beetle's eyes, mouth, brain, and antennae are found. Some horned beetles have extensions on their head that remind scientists of horns or antlers. Thorax— The thorax is the powerhouse of the beetle body, divided into three parts. The beetle's six legs and its wings are attached to these parts. Thick, hardened front wings, called elytra, cover most of the beetle's body and its back wings offer great protection. Some species are able to trap moisture under their wings, helping them survive in deserts where water is scarce. Other species can live underwater because they are able to trap air under the elytra. Abdomen— The abdomen contains the organs for digestion and reproduction. A tough exoskeleton and the elytra protect the beetle's soft membranes and keep the beetle from drying out or getting waterlogged. Flexible, long antennae on the beetle's head act like feelers to help the beetle find food, a mate, and places to lay eggs. They also alert the beetle to vibrations in the air that could mean a predator is near. A beetle uses its legs to regularly clean those important antennae. Tiny hairs on its body and legs, called setae, are sensitive to touch, sound, smell, taste, and light. Most beetles have compound eyes (eyes that are divided into many six-sided compartments). Compound eyes are very sensitive to movement and can probably see in color. Beetles that rely on vision for hunting (ground beetles) or breeding (fireflies, Lampyridae family) have larger eyes. Whirligig beetles (Gyrinidae family), which swim on the surface of ponds, have divided eyes: one half for vision under water, the other for seeing above the water so they can find food that drops in or floats by. Sunburst diving beetles carry a bubble on their rear end that pulls oxygen from the water and helps the beetle stay under just a little longer. Most beetles can fly, although they do so in a slow, clumsy manner. Water beetles are good swimmers, and many can fly as well. Some beetle species that live in deserts have lost the ability to fly. All beetles have jointed legs, but leg shape and size varies, depending on the beetle's lifestyle. For example, long and slender legs are made for speed (ground beetles, Carabidae family); broad and ridged legs are for digging (dung beetles, Scarabaeidae family); legs curved and shaped like a paddle are for swimming (water beetles, Hydrophilidae family); and large hind legs are for hopping (flea beetles, Chrysomelidae family). Some species even have a sticky pad on the bottom of each foot to help them walk up slippery surfaces. All species have a pair of claws on each foot. Many beetles need the sun to warm their bodies before they can run or fly quickly. Stay safe! Beetles have a lot of different ways to protect themselves from becoming someone else's lunch. The hard, shiny elytra is often enough to keep a beetle safe from other insects, or other beetles! Dome-shaped leaf beetles (Coccinelidae family) and ladybird beetles (Chrysomelidae family) pull their legs and antennae under this "shell," just like a turtle does. Some ladybird beetles release sticky yellow blood from their legs to gum up the antennae and mouthparts of the attacker. Flightless ground beetles squirt out jets of formic acid, which burns the skin and causes eye damage. Leaf beetle larvae are so poisonous that people of the Kalahari Desert use them to tip their hunting arrows. 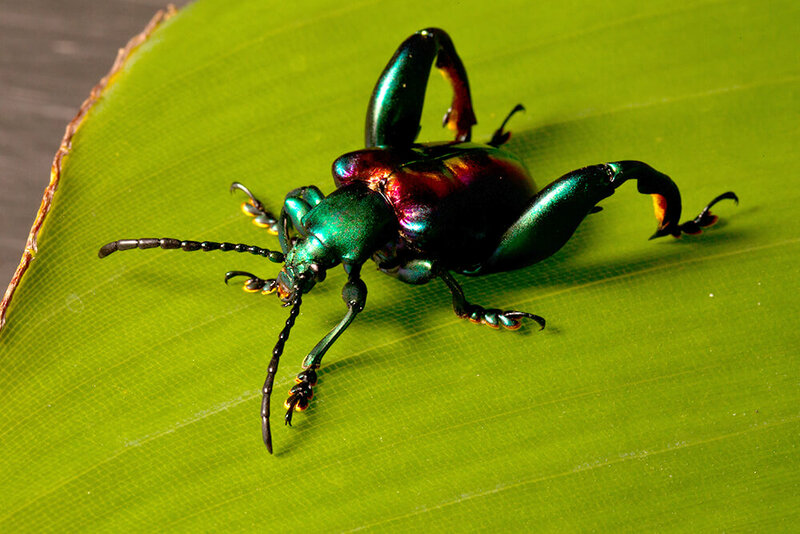 Brightly colored or patterned beetles usually taste very bad to predators. And camouflage works great for beetles living under rocks or bark, or in the soil. Beetles have lived on Earth for about 300 million years and can be found almost everywhere, from deserts to lakes, rain forests to polar ice caps. Most beetle species live on land. They tunnel underground, or in wood, or in the carcasses of animals. Some live in the nests of ants and termites: the nest protects the beetle from predators, and the beetle keeps the area clean by eating the ants' waste! Beetles eat almost everything: plants, other insects, carcasses, pollen, and dung. Some beetles living in water eat small fish and tadpoles; Phosphuga atrata eats snails. Most beetles have a very good sense of smell to help them find food. Their front jaws, called mandibles, vary in size and shape, depending on the species. Predatory beetles have extended mandibles that can seize, cut, or crush prey. Some rove beetles catch flying insects with a long, sticky tongue. Specialized nectar feeders have tube-like mouthparts. In turn, many animals, and even some carnivorous plants, eat beetles! The benefits of beetles. 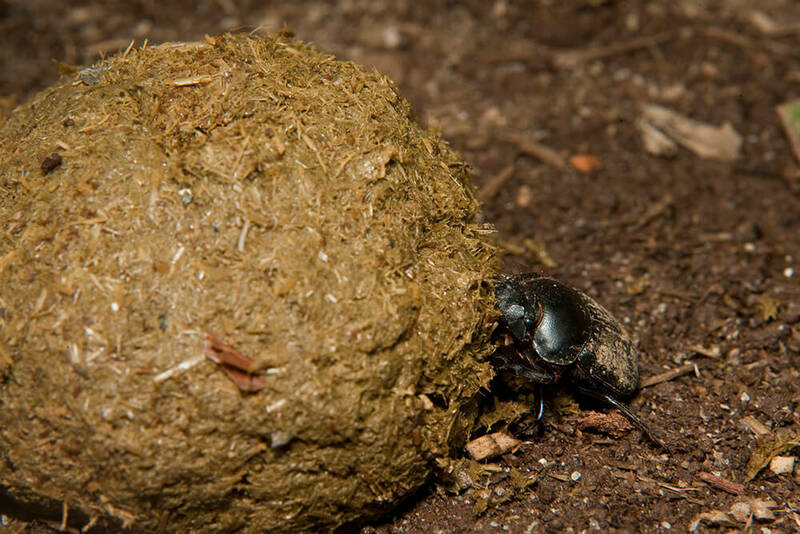 Beetles create usable soil for vegetation by eating animal waste, rotten wood, and animal carcasses. They pollinate flowers and keep other insect populations in balance through predation. They are key creatures in maintaining the world as we know it. Let’s hear it for beetles! Egg— Beetle eggs are usually soft and smooth. They can be laid in the soil, in wood, under tree bark, on leaves, or in carcasses. Depending on the species, a female may lay a single egg (like chafers, Scarabaeidae family) or a batch of several thousand (such as oil beetles, Meloidae family). Most females do not take care of the eggs once they are laid. Larva— Looking like worms or caterpillars, beetle larvae hatch from eggs. They are sometimes called grubs at this stage. Most beetle larvae have from one to six simple eyes on each side of the head and mouthparts for eating. They eat and grow, molting as they get bigger and bigger. Pupa— At the end of the larval stage, the grubs either create a pupation cell or find a safe place to go to protect their body during the change. For example, scarabs form their protective cell out of soil, wood particles, and their own saliva; diving beetles burrow into the bank of a water source; many species of wood boring beetles just stop eating and pupate within their own feeding tunnels. Beetles that go through a pupal stage develop the adult legs, wings, antennae, and reproductive system at this time. However, a few beetle families skip the entire pupal stage and keep the features of the larva! Adult— When the adult beetle emerges from the pupal stage, its body is soft and pale. Soon, the body covering becomes hard, and the beetle's true colors appear. The hind wings and elytra push to the outside of the body. Be sure to look for diving beetles and dung beetles in the Zoo’s Elephant Odyssey. The Zoo hand raises its own sunburst diving beetles. The young, commonly called water tigers, are voracious predators with huge eyes and jaws. Keepers remove them from the exhibit and give them their own individual containers—since they might eat each other, they make terrible roommates! During pupation, they are placed in tanks where they can leave the water and scramble onto a sandy “beach” to crawl under a piece of bark, moss or other object as their exoskeleton transforms in the pupa stage of metamorphosis. After 8 to 10 days, an adult beetle emerges from the pupa. How do diving beetles breathe underwater? They capture surface air and store it under their wing covers. Sunburst diving beetles carry a bubble on their rear end that pulls oxygen from the water and helps the beetle stay under just a little longer. You can see them up close at Elephant Odyssey. Many beetle species are considered pests. These beetle pests cause millions of dollars in damage to plant products and transmit disease. Woodworm and death watch beetles (Anobiidae family) can eat furniture and wood floors, and carpet beetles (Dermestidae family) eat wool; weevils (Curculionoidae superfamily) attack crops, such as cotton, apples, corn, and more. The Colorado or potato beetle Leptinotarsa decemlineata can destroy a potato crop. However, not all beetles are harmful. Farmers often release ladybird beetles to eat aphids and other insects that might hurt a crop. Ground beetles feed on those nasty potato beetles! Several known beetle species are at critical risk. For example, the Frigate Island giant tenebrionid Polposipus herculeanus is native to only the small Frigate Island in the Seychelles island chain in the Indian Ocean. As more humans arrive on the island, the flightless beetle’s habitat is destroyed. Agricultural development in central California’s vernal pools has left the delta green ground beetle Elaphrus viridis at critical risk. California's state flower, the California poppy, is pollinated by a beetle species. Beetles account for 28 percent of all living animal species. They are the largest order of insects. 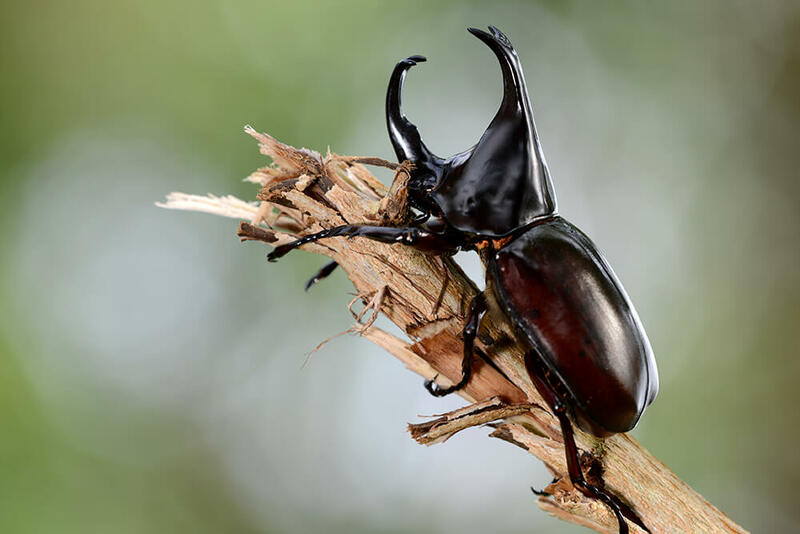 Super strong: The rhinoceros beetle can lift over 800 times its own weight. Most beetles have a hard time righting themselves when upside down. But the click beetle has a mechanism on its underside that helps it spring into the air to right itself. The beetle makes a clicking sound when it does this, hence the name. Many beetles make squeaking noises by rubbing parts of the body together or by tapping on hard surfaces. They have better hearing than beetles that do not make sounds. The larvae of an Indian species of long-horned beetle have been known to live for 10 years in captivity, but the adults only live a few months at most. Stag beetle larvae can remain inside a dead tree, eating away at the rotting wood, for up to three years. Wireworms are not worms at all but click beetle larvae. Atlas beetle larvae grow to 5 inches (13 centimeters) and can live underground for up to 18 months.